The front of the View is perfectly minimal - there’s just a single button that’s encircled by an LED light and a fisheye lens with a 1440p sensor. 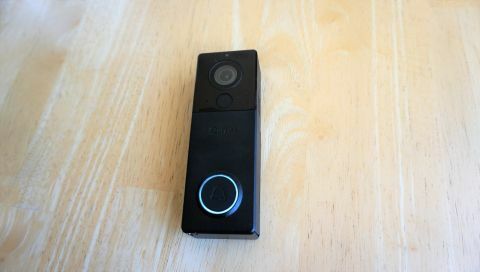 That makes any video captured on the August View a slightly higher resolution than other doorbells on the market that still capture 1080p, and could help you spot details and identify unwanted guests should the need arise. Unfortunately, however, that two-way conversation will only include a live video feed if you use the app or an Amazon Echo Show speaker - as of right now, Google doesn’t support third-party security devices on the Google Home Hub. That’s not a deal-breaker as you’ll still be able to connect the View to both Google Assistant and Apple HomeKit, but for now video remains relegated to either Amazon or the app. We'll continue to test these features over the coming weeks and will report back once we've had some more time with it. On paper the August View sounds great: It's compatible with all three of the major players in the smart home space right now, offers 1440p video coverage and, because it's battery-powered, can be installed on any home or apartment. If August can iron out these issues in the coming weeks, the August View could be a solid competitor to the Ring 2, despite being slightly more expensive. If it can't, well, there are a few other great options out there.